And it's a hot one. It was up to 35C (95F) yesterday, for the second day in a row. It's not humid at all though. And the next several weekends are almost sold out. Next weekend should be fun. There's a special event fundraiser happening on Saturday with a band and everything. And one of our long time campers is donating a hamster wheel for people to use as a fundraiser for the park. I've seen these in pictures, but I've never seen one live. 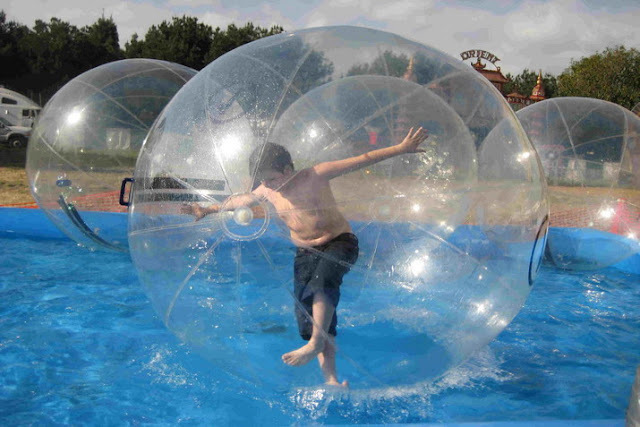 It sounds like a lot of fun just watching other people do it! Found this pic online. I think this is what it's going to look like. Apparently it's really hard work and you're only allowed a five minute maximum because you could get heat exhaustion being inside for longer than that. I think five minutes would be enough! The entrance gate was busy yesterday and Ruth sat up there alternating with one of our summer students. I was in the office and it was pretty much non stop busy for about four hours yesterday evening with people checking in, buying firewood, the phone ringing, and even making reservations into August. Maybe today I'll wander around and take some pics for you for tomorrow's post. Had a young barn swallow fall out of it's nest. It's just learning to fly, but it hasn't got it quite figured out yet! The mom and dad were not happy that we were so close to it...swooping down on us and chattering like crazy. But we didn't want it to get trampled...it was on the concrete right at the entrance to one of the washrooms. We did get it out of the way eventually. Two more still in the nest! I've been busy on Amazon. I've got a few shipments coming, from both Amazon.ca and Amazon.com. The other day I ordered a new GPS from Amazon.ca, as well as a new grinder for the shop so that I can sharpen the lawn mower blades better. It was a $120 grinder on sale for $40. Great deal. And, I ordered some screen protectors for our iPhone in the same order so that there wouldn't be any shipping charges. On Amazon.com, I ordered some parts for the little blue car. It's just gone over 200,000 kms (120,000 miles) and you are supposed to change the timing belt every 100,000 kms. The last time it was done was when we were in Kingston, Ontario in 2010 and I paid someone to do it because I didn't have anywhere suitable to do it myself. This time, I'll do it myself, but I needed two specialty tools and I ordered them from Amazon.com. Even with the cost of those tools (around $40) I'm going to save about $500 by doing the job myself. I also bought a new valve cover gasket. So I still need to buy the timing belt itself, and a new serpentine belt. Then, I'll pick a quiet day in September and spend it up at the shop doing this work. It'll be an all day job. Two of my packages have been delivered and are waiting at the post office in town. I'll go get them on Monday. Going to be another hot one...better get at it. Enjoy your Saturday! Happy Campers - The best RV toilet treatment there is! Here is grandson Cameron's annual watermelon pic. He cracks me up. Sure do miss the little guy! 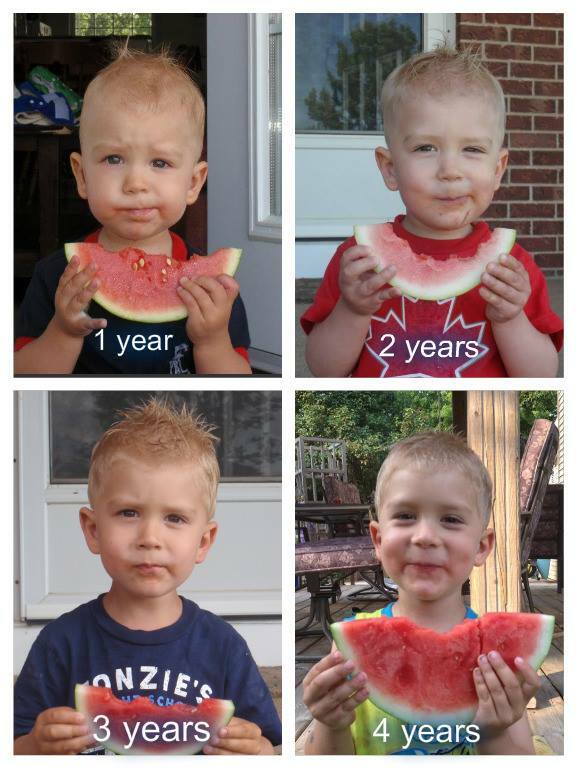 Cameron is so cute - love the annual watermelon picture. Stay cool, that is bloody hot. After days upon days of unending sunshine and smoke due to forest fires it is finally raining today here on Vancouver Island - lightly. This hopefully will give the firefighters a much needed break and lower the fire risk a tiny bit. Yes, we love this idea of Lindsey's with taking an annual picture of Cameron. Now she has to come up with one for Sadie. Yep, it is pretty darn hot and we did get a small rain shower yesterday late afternoon but it wasn't nearly enough to any good. Glad to hear that you have been having more rain and that it has assisted with the forest fires you are having in B.C. looks like it will be a fun day on Sat. Your little guy is sure enjoying his watermelon . What a cutie. We are looking forward to seeing this all set up and all the kids having a go at it, should definitely be a fun day. Cameron loves just about everything but yes, he is really enjoying that watermelon. I love that smile/smirk of his! Cameron is a cutie and has a lot of energy! Full page ad in today's paper for Amazon on July 15th! Looks like you two are busy. Adorable Cameron pics - cute idea! Yep, we sure are, it looks like it will be busier than last year. The annual watermelon picture is a great I idea! We look forward to his new picture each year! Now she has to come up with an idea for Sadie. Just found your blog and see you are from Sk. and staying at Cabri park, we are originally from Hazlet Sk. but moved to Kamloops BC in 1987. We have been full timers for 6 yrs. now and love it. You are parked just north of Pennant a few miles, our daughter Brenda and husband Kerry own the hotel there. keep up the good work and we will be check in. We know exactly where Hazlet is! We haven't been there but we know where it is as well as Pennant. We drive by Pennant every time we go into Swift Current for groceries. Never knew that there was a hotel there though, again we have never actually gone into the little community there, we just never seem to have any time to explore the area here. If you are ever in the area between May 1st and Sept. 30 feel free to drop by and say hello. And, thanks for taking the time to leave a comment, we love hearing from our readers. Look forward to more of your park pics.....grandkids are great - love the traditional watermelon pics..what a great 21st presentation they will make. Grandchildren are wonderful, I do wish that we could see more of them though. Ha, that would be a fun presentation! We really enjoyed your park. The remoteness makes it a great getaway. Thanks Chris! You are right about it being pretty remote here but when it is busy you would never know that it was in the middle of nowhere. Cameron sure is growing fast! but that look on his face hasn't changed much in the last 4 years! Sounds like summer is finally in full swing. Next weekend does sound like a great time. Do you two have to arrange for the entertainment? It is definitely in full swing now. We won't have much down time for the next 4 or 5 weeks! No we don't have to arrange for entertainment but one of the campers had approached Kevin with this idea so Kevin went to the Board of Directors with it and they really like it. Cameron is a sweetie, isn't he?! Gotta love it when things are busy, the days fly by and you feel like it was successful. Good thing for the maintenance, it will pay off. Yes, it is nice to see it busy but it also keeps us super busy, which can sometimes be a good thing and sometimes a bad thing! Always better to keep up with maintenance rather than letting something break down. Been RVing for 30+ years - full-timing in our class A motorhome for the last 8. Been using Happy Campers for three years - FINALLY something that does what it claims! Would never buy anything else. HIGHLY RECOMMEND IT! So glad to hear that you are really happy with this product. I don't think we have heard a bad thing about it. We googled Cabri Regional Park, because we don't know much about it. But with a nice lake and the hot weather Western Canada has been experiencing, it's not surprising you're popular!